The #RoadTo100 continues on FORCED PERSPECTIVE! It’s that time of the year, folks! Get your popcorn and snacks ready, because the SUMMER MOVIE SEASON IS UPON US! The 2016 Summer Movie Season is in full swing! Busy weekend for yours truly – this is the first time in a long while (probably in the last six months or so) where I was actually able to pull off seeing TWO movies in one weekend. How about that, eh? And it only gets better – I already have plans this Friday night to see Green Lantern, so make that THREE films in one week. Not too shabby, if I may say so. But I’ll save the Green Lantern and DC Comics chatter for this weekend. Right now, it’s all about X-Men and Marvel, and I figured I’d start my pair of reviews with the film that I saw SECOND, not for any particular reason, mainly because it came out before the other film (Super 8) did, so I decided that I’d post this one first. 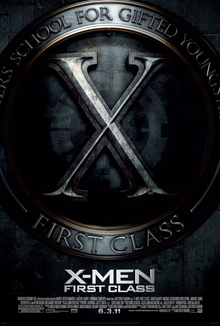 Plus, what do X-Men: First Class and Super 8 have in common? There are already great reviews for these films that can be found on this site (FK99 did X-Men, while Adolfo tackled Super 8). Then again, you know what they say – it’s never official unless I, SportsGuy515, review it (hahaha, just kidding).